A Quintain, sometimes called a Quintet, is a poem or stanza with five lines. It can follow any meter or line length. The Limerick is the most well-known example of a Quintain. Since there are many different types of poetry, it probably won't come as a surprise that even this branch of poetry has many variations. Let's take a look at the Quintain rhyme scheme, in all its colors. Poets can paint evocative scenes and prompt deep reflection in just five lines. That said, those five lines can be woven together in a number of ways. Let's start with the Cinquain. The cinquain is unique in its syllable count of each line. The first and last lines have two syllables. The second line has four, the third has six, and the fourth has eight. So, it is a 2-4-6-8-2 scheme. The rhyme scheme for English quintains is usually A-B-A-B-B. There is no set measure or foot (the number and type of syllables or feet). 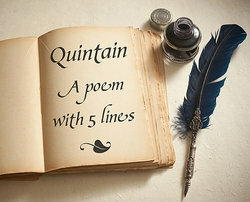 Quintains work well in long poems like ballads. The rhyme scheme for this is usually A-B-B-B-A or A-B-C-B-A. There is no set measure or foot. The rhyme scheme of a limerick is A-A-B-B-A and there is no set meter or syllables. A-lines are iambic tetrameter and B-lines are iambic trimeter. Many times, the third and fourth lines are shorter than the other three. These lines are usually six syllables, or iambic trimeter. The rhyme scheme is A-B-C-D-C. I touch the night above. and walks the same long wynd. and know my heart is thine. to life now free and done. Pentastich is the free verse or blank verse version of the Quintain. And never deserving of Hell. On the soft sandy beaches of love. From tears of loss and recrimination. But will never be able to fill the empty heart. Originally, these had no set meter or form but, soon, iambic pentameter was widely used. The rhyme scheme is usually A-B-A-B-A. These lines are usually eight syllables, or iambic tetrameter. The rhyming scheme varies, but there are never more than two consecutive lines that rhyme. Common rhyme schemes are A-A-B-B-A and A-B-B-A-A. As you can see, the list goes on and on. Poetry's complexity is one of the many reasons why people go on to enjoy a lifelong appreciation of this art form. One could spend their entire life studying poetry and still make new discoveries. Its structure can vary and it's almost always rich in symbolism. "Quintain Rhyme Scheme." YourDictionary, n.d. Web. 18 April 2019. <https://examples.yourdictionary.com/grammar/rhymes/quintain-rhyme-scheme.html>. A Quintain, sometimes called a Quintet, is a poem or stanza with five lines. It can follow any meter or line length. The Limerick is the most well-known example of a Quintain.Since there are many different types of poetry, it probably won’t come as a surprise that even this branch of poetry has many variations. Let’s take a look at the Quintain rhyme scheme, in all its colors.